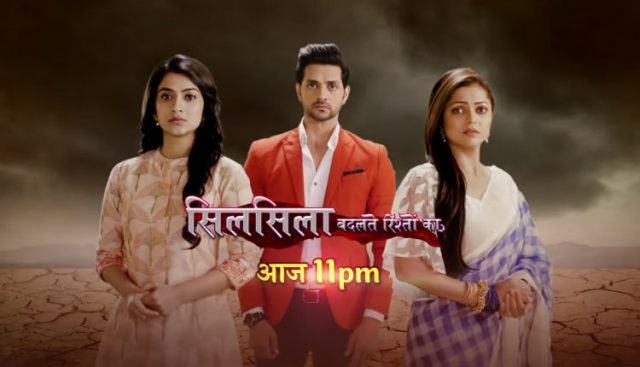 In the latest update of Silsila Badalte Rishton Ka written update of 5th November 2018, there is six years leap. The today’s episode begins with Dida was very upset because of Kunal. He was not here with the family members to celebrate the festival of lights that is Diwali. Mauli comes at home with the plate of aarti and there are candles on it. Mamma and Dida insist to Mauli not to pose tough, she surely has not recovered. Mauli also breaks into the cry to listen to this but she completes the ladies to celebrate first Diwali of her baby to be. She said that we have to celebrate this Diwali for the happiness of the baby. There, Kunal watches to Nandini who decorated the roof and blow the crackers. He saw him in a very way. Mauli, Dida and Mamma did the Pooja together and lit the crackers. They all are so happy with this moment. Mauli’s house was still decorated. Dida appreciates that Radhika for the decorations and asks her to call Mauli, she asks that where has she been. Mauli comes from behind announcing that she is here. She walks to Dida, and touch her feet and tolds to Dida that she is about to break her six years records and prepare a halwa. Mamma goes to soak the nuts for the halwa. Mauli sends Pramilla to brought the decoration items. Dida was soo worried about her child and asks Mauli to call him. She makes the call, the other person calls her a sweet-heart and asks her to open the door. Mauli was left holding a heap of gifts boxes and asks him to stop right here. Dida asks Mauli that to hold some boxes and help her child. She complains that he bought the whole markets at the last moments. The whole flower petals are over the pile turns at Mauli. She was showered with the petals. She and the young man looks into each other’s eyes. Precap: Mauli and Ishaan both leave with Mishti. She was not ready to go without her friend.